Join us as the noted author Elaine Weiss shares a(nother) moment in history that changed all of our lives. In 1920, after seventy years of struggle begun by Susan B. Anthony and Elizabeth Cady Stanton, the 19th Amendment to the Constitution granting women the right to vote was near to passing. The amendment had 35 “yes” votes but needed one more. Tennessee was their last chance. That August brought a divergent group of suffragists, or “Suffs,” to Tennessee, a holdout state that could push the count to 36. They came to confront the “Antis” (women who feared the moral decay of the family and nation) and the Tennessee politicians who did not want women to influence the upcoming election. About the Speaker: Elaine Weiss is an award-winning journalist and writer. Her first book, Fruits of Victory: The Woman’s Land Army in the Great War, was excerpted in Smithsonian Magazine online and featured on C-Span and public radio stations nationwide. 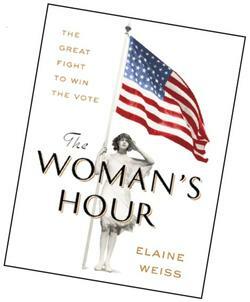 Highly acclaimed by the New York Times Sunday Book Review, The Woman’s Hour has been optioned by Amblin TV for adaptation as a TV movie or limited series. Make checks payable to: U.S.R. Historical Society. Tickets are "will call" only; your name will be on a list at the door. Directions will be emailed to you with your confirmed reservation. For additional information, contact Michelle Dugan at (201) 995-0171. Note: For advance reading, books may be purchased ahead for $20 at The Hermitage Museum, Ho-Ho-Kus, and Mahwah Museum. You may also reserve copies to purchase at the luncheon by using the downloadable PDF; by answering the question on the Brown Paper Tickets site (https://www.brownpapertickets.com/event/3657575); or by letting us know by phone at (845) 634-9629 by October 24, 2018.